Numerous studies1 indicate that tai chi improves muscular strength and flexibility, relieves pain, and improves quality of life. Muscle strength supports and protects joints from injury. Flexibility exercises increase range of motion and facilitate circulation. 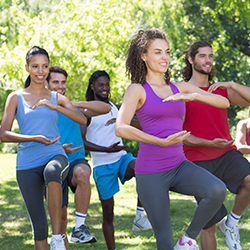 Tai chi movements emphasize weight transference to improve balance and prevent falls. The most common type of tai chi injury is to the knee joints. Tai chi uses deep knee stances, which strengthen the legs but can harm the knees from overuse of improper technique. If practiced correctly with the body in proper alignment, the thighs and hips hold the spine upright, not the knees. Don’t lock the knees. Keep them aligned over the feet, but slightly bent. Squat within individual comfort zone. Don’t lean backward or forwards. Keep the back aligned upright. Don’t force movement. Move as if gently swimming in the air. Include warm-up and cool-down exercises. Wear comfortable shoes for balance. If a knee injury or any musculoskeletal injury or condition interferes with the practice of tai chi or another activity, Direct Orthopedic Care’s team of orthopedic surgeons, specialty trained physician assistants and physical therapists are available seven days a week to provide orthopedic health care.